If you’ve lived with diabetes for very long, you know that once a year you’ll have a comprehensive medical exam to get a big picture view of your health and stay on top of preventing diabetes complications. While it may seem unnecessary to have all of those labs and other tests done, the annual office visits are actually quite important. They can identify early signs of organ damage and even head off complications before they start. Keeping the macrovascular (heart disease) and microvascular (kidneys, eyes, nerves) damage in check goes a long way toward ensuring you live well with diabetes. Let’s break down some of the tests that will be ordered to understand why they are useful to you and your healthcare team. Blood pressure is measured at every office visit, but the annual exam can give an opportunity to discuss the need for medication if the BP has been above range on multiple occasions. The blood pressure goal for people with diabetes is <140/90. Weight and BMI tracking will also be done at each visit. A1C — The A1C is recommended every 3 months if you are not at goal (typically <7%), but can be stretched to every 6 months in those who are well-controlled. This number guides therapy decisions and gives a snapshot of what the last 3 months of blood sugars have looked like. BMP or CMP — The basic metabolic panel includes glucose, electrolytes, and measures of kidney function. The comprehensive metabolic panel includes all of that plus additional labs to monitor the liver. 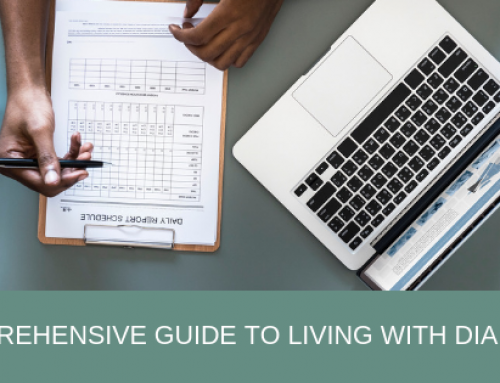 These basic or comprehensive metabolic panels are both important because some blood pressure medicines can disturb electrolytes while other diabetes drugs can affect the kidneys or liver. In most people, getting these panels once a year is enough, but may be ordered more often if abnormalities are being watched. Lipids — A cholesterol panel is done annually to follow the total cholesterol level, LDL, HDL and triglycerides. A change in the national guidelines for lipids has led to a shift away from simply looking at LDL to determine the need for a statin (cholesterol medicine). If a statin dose changes or if the cholesterol started off significantly out of range, the lipid panel may be performed more often. TSH and B12 — Thyroid panels and B12 levels are not always part of the routine labs checked each year, but it is not uncommon to check these in people who show symptoms of hypo- or hyperthyroid or low B12. Another screening test for evaluating kidney function is microalbumin, which can detect small amounts of protein in the urine. Typically done once a year, it lets us know if kidney damage may be occurring. While in the early (microalbumin) stages (<30 mcg/ml), kidney damage can be reversed. Once higher levels of albumin are found (>300 mcg/ml), the kidney decline may not be fully restored. Treatment for increased levels of microalbumin are blood pressure management and glucose control, so it’s important to know these levels and intervene as soon as needed. Protecting feet from infection and ulcers is vitally important. Doing a thorough inspection of your feet every day can literally save you from significant time, suffering and dollars spent on treating preventable problems. In addition to your own daily checks, a comprehensive foot exam will occur at least annually. So what is your doctor or nurse looking for? Determining blood flow, finding skin changes, and testing the level of sensation are the goals of the foot exam. A small plastic wire called a monofilament will be used to test your sensation or development of nerve damage (neuropathy). A tuning fork vibration test or rarely, nerve conduction studies, will also be done. If a loss of sensation or neuropathy is detected, you may be referred to podiatry to stay on top of ulcer prevention. The part of the eye responsible for detecting light and forming visual images is the retina. Small blood vessels in the retina can be damaged and by chronically high blood sugar, called retinopathy. 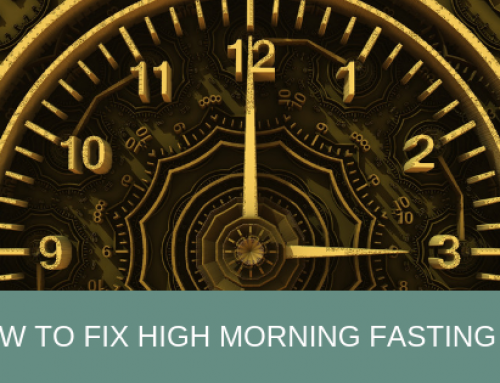 Catching these changes early allows ophthalmologists to correct the problems before vision is impaired. When this happens, the risk of blindness with diabetes is quite low. To properly screen the eyes, either a yearly dilated eye exam or a digital photo of your retina are needed. Some primary care clinics may have the equipment to take the digital photos which are sent electronically to ophthalmologists. For photos that are interpreted as normal, you have one less office visit to make. “But wait, I just saw my eye doctor to get my glasses adjusted. Do I have to see an ophthalmologist, too?” Great question. If your optometrist can perform these screening exams to look at your retina, this is enough. If problems are seen, an ophthalmologist would be necessary because an optometrist cannot correct and treat retinopathy. People with diabetes may have a more difficult time fighting off disease once it occurs. The influenza shot will be recommended yearly, while the pneumonia (pneumococcal) and hepatitis B vaccinations will be given as a one time series. The tetanus and shingles vaccinations may also be recommended depending on your age and risk of disease. The annual diabetes visit can also be a good time to discuss whether it’s time to see the dentist, dietitian or other medical professional (cardiologist, nephrologist, etc.) that can help keep your health on the right track. If you’re a smoker, a discussion on smoking cessation will also be on the agenda. Aspirin therapy – The recommendations for aspirin for preventing heart disease have changed and become more individualized over the years. Current medical guidelines recommend a daily low dose (75-162mg) aspirin for men with diabetes over age 50 and women over age 60 who are at high risk for cardiovascular disease. Your healthcare provider will look at your risk factors and determine if daily aspirin therapy is right for you. While this annual visit can seem like “one more thing” on a long medical to-do list, it can be instrumental in finding problems early or keeping them from happening at all. Go into this visit with questions prepared, blood sugars recorded, and ready to understand each test that is ordered. Your participation in your health is vital for living well with diabetes. Subscribe to our list here to gain access to a handy checksheet for your annual diabetes visit! 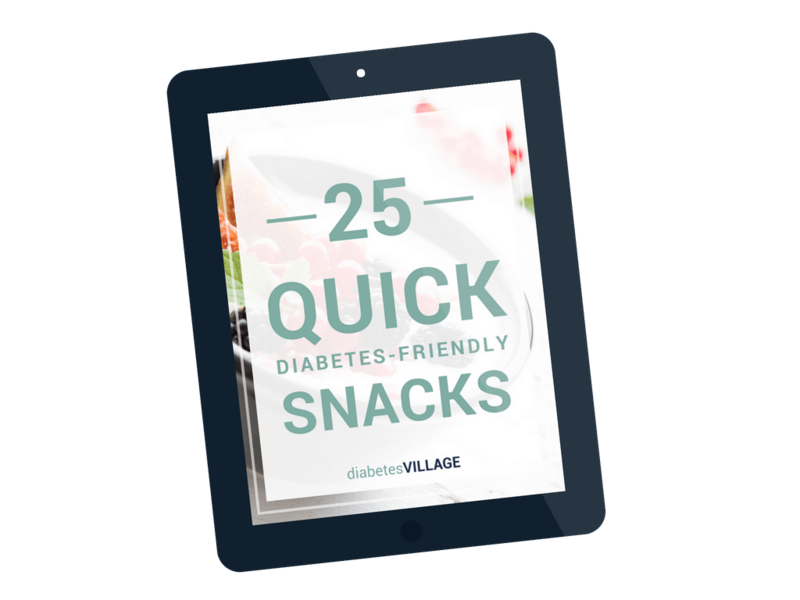 Want some quick and easy diabetes-friendly snacks? With this list, you won't have to wonder what to eat in between meals! Download it to your phone or tablet and keep it handy, or print it off and keep it by your fridge. Thank you! Check your email for your free gift. 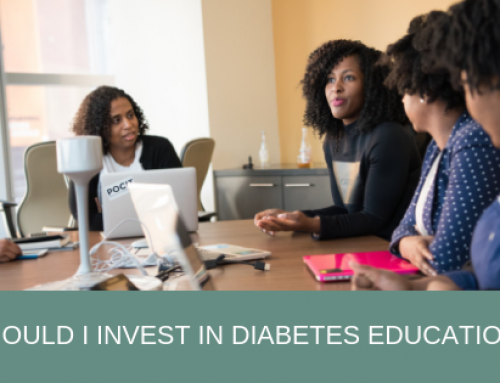 Should I Invest in Diabetes Education? Diabetes Village wants to create a welcoming, friendly community for people like you! As a Diabetes Educator, I'm passionate about sharing tips and tricks to help you live life to the fullest. * No information on this site should be used to diagnose, treat, prevent or cure any disease or condition. The author of this site encourages you to consult your physician before making any health changes. The information on this website or in any linked materials is for informational purposes only and is not intended to replace a one-on-one relationship with a qualified health care professional. The content of this website is not intended as medical advice. By using this website, you accept this disclaimer in full.